(Nanowerk News) The technique, developed by researchers at the Zelinsky Institute of Organic Chemistry in a collaborative project, employs the metal palladium, which interacts with “carbon reactivity centres” found on graphene. Graphene is an incredibly strong one-atom-thick layer of carbon touted to be an excellent conductor of heat and electricity. Several types of defects on graphene surfaces are known to increase the reactivity of its carbon atoms: i.e. their ability to form chemical bonds. If researchers can locate these defects and manipulate them, they will be able to maximize the use of graphene’s properties. For example, locating and removing defects is important for applications that require perfectly smooth graphene. 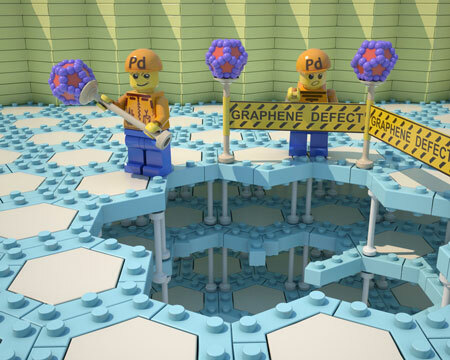 In other applications, such as in catalysis and certain biomedical materials, some defects are actually beneficial because they allow the incorporation of additional elements, such as metals, into the graphene. When the palladium complex Pd2(dba)3 is dissolved in chloroform, it forms a dark red solution under normal circumstances. But when graphene or another carbon material is added to the solution, the palladium is completely consumed. As a result, the solution turns from dark red to colourless. Using advanced imaging techniques, the researchers found that the palladium clusters selectively attach to graphene’s surface according to specific patterns, depending on how reactive the carbon centres are. Individual palladium particles settle onto point defects, local accumulations of particles are present on larger defects, and short chains outline linear defects. These defects are normally invisible under an electron microscope. The palladium particles act like a contrast agent, allowing the spatial imaging of the chemical reactivity, and thus the defects, of graphene layers. “Metal mapping of carbon materials provides unique insights and reveals hidden information about fascinating properties at the molecular level,” says project leader Professor Valentine Ananikov. The team’s findings indicate that using palladium markers, more than 2,000 surface defects, or reactivity centres, on graphene can be individually located, per square micrometre of surface area. The researchers say that the unexpected capacity of graphene to accommodate so many reactivity centres challenges scientists to re-examine their understanding of the electronic and structural properties of carbon materials.